Whoop-de-whoop! 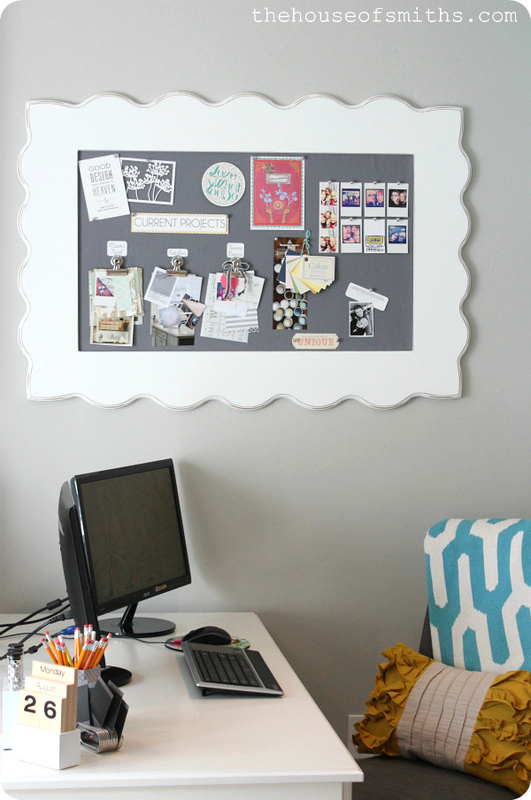 Who's ready for another Blogger's office makeover post!? It's taken me quite some time to get around to finally posting about this little area of my office, the corner reading/relaxing nook... but here it is! I couldn't be happier with how it's all turned out. I love it! Even though this basement office is quite small, I knew from the beginning that I wanted to create 'zones' in the space. Individual, specific spots where I could do different things or accomplish tasks. 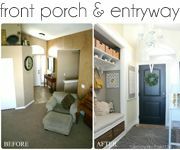 I think, subconsciously, when I go into ANY new project around here, I tend to have the goal of functionality at the forefront of my mind (well... at least really close behind pretty design and decor, ha!). This is probably because it's a necessity, being that we live in a small house. Even though it's sometimes harder to fit everything into the space that I want to, I've realized that it's NOT impossible, no matter what size your room is... it just takes a little planning. 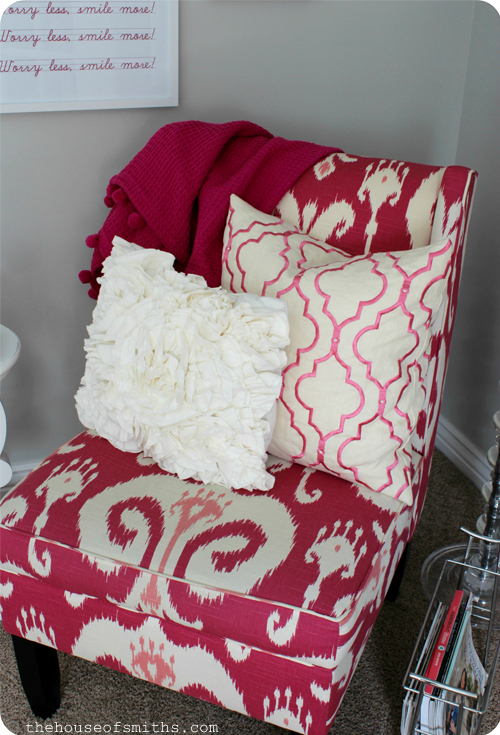 chair and magazine holder - Joss&Main, ruffle pillow - Target, geo pillow - Pop O' Color. I went back and forth with what to put on this wall above my funky pink Ikat corner chair that I got from Joss & Main last year, and kept going back to a gallery wall with fun, colorful prints. Even though we have a similar gallery wall upstairs, with our family photos displayed in white Ikea frames, I still wanted to forge ahead with the idea, because I love the clean lines and capability to use whatever you want inside a classic white frame. I commissioned my friend Amelia from Brightsides Design to help me come up with some prints that would be good for my personal office space. I knew I wanted designs that were fun, casual and promoted happy thoughts. "Awesomer" is my word for this year, "Worry less, smile more" just seemed fitting for life in general and "I'm kind of a big deal on my blog"... well, come on, that's just funny and motivating right there. ha! It's a daily reminder that even if my projects aren't the coolest in blog-land, or my pictures aren't the best... that in the end, I'm really the only one who needs to worry about how happy I am with the work I've done. I'm a firm believer that there's never a limit on how much positive reinforcement you can give yourself; no matter what you do for a living. 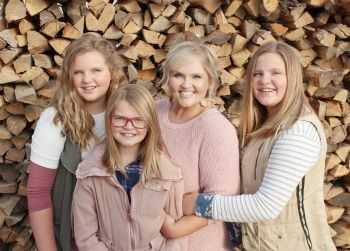 Nurse, Mom, Student, Blogger... sometimes having confidence in our abilities to achieve things is all it takes to give you a good shove in the right direction! You can purchase any of these designs from Brightsides Design. 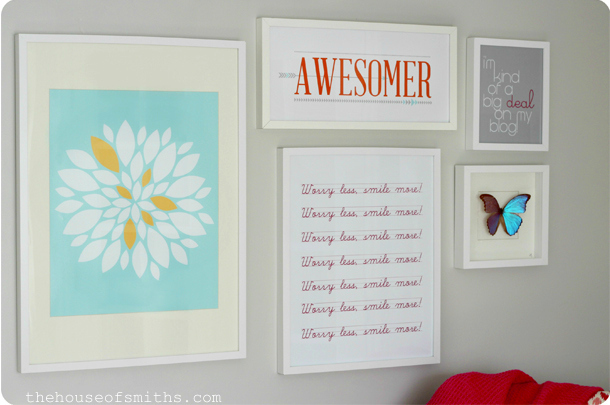 Do you surround yourself with positive messages in your home? Do you feel that it helps? You might have noticed this blue-winged beauty in some other pictures of mine, but it's only because I adore her so much. Yes... it's a her (or at least I say so). My sweet friend Brittany from Trinkets and Butterflies gifted her to me last year, when only a few months before I had bought some jewelry from her and told her how amazing I thought her story and butterfly art was, while at a local craft and hobby show here in Salt Lake City. 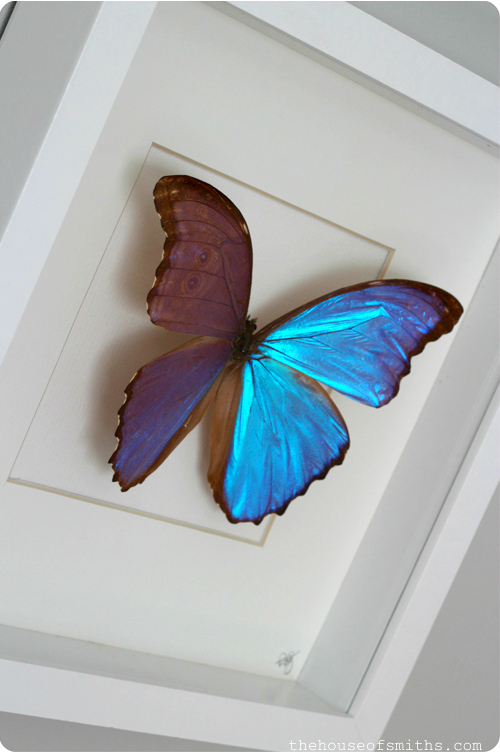 "Every butterfly I use in my frames and jewelry are farmed all around the world, not killed. They live their full life in the farms or are legally collected. The farms release a certain percentage of each batch back into the wild to protect each species. It is a very "green" process, and provides jobs to people to collect them instead of poaching, and diminishing each species." Pretty neat eh? You can see her listings for jewelry at her Etsy shop, along with a few mounted and framed butterflies, but her newest items usually show up on her Facebook page first. How great would a collection of these be in a nursery!? Originally we had a yellow geometric shade on this great, heavy-duty Pottery Barn lamp base, but in the end, this little corner was just still too dark, so replacing the yellow shade with a white drum shade from a different lamp in our home, made all the difference and really gave off the right amount of light that we needed. This cozy little corner has come a long way. I love that I made the choice to designate this area to JUST relaxing, reading, looking at magazines or finding things that inspire me. It forces me to take a break from my computer to recharge and refuel; which is key for me, because even though I love writing... creating is my forte and I tend to burnout quickly when in front of the computer for too long. I'm dubbing this the BEST part of my office design yet, for that reason alone. 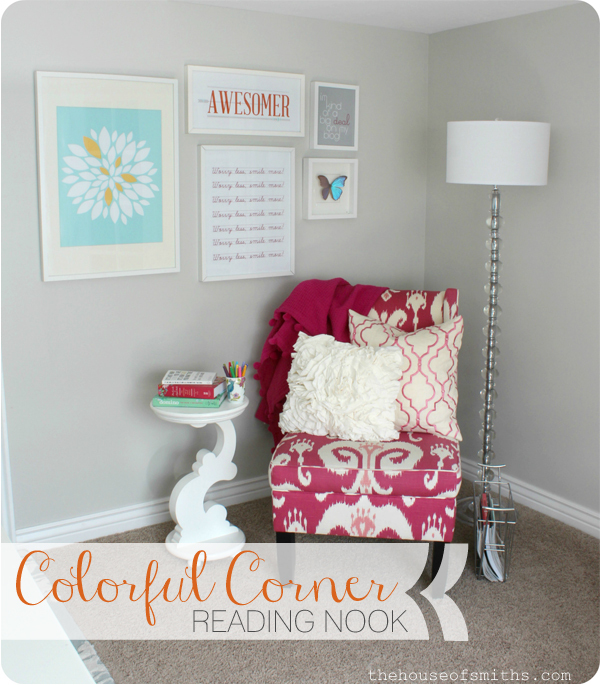 Is the color in your nook/reading area the upward color? It looks more grey and I love it! The pink really pops! Love the corner. What a happy place. I'm so glad it's led to family moments and cherished conversations. Such a pretty nook in your office. I'm sure it's perfect for inspiration. 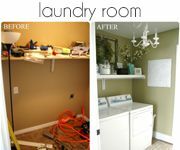 love love love it...I am struggling with having "spaces" in my HUGE living room/dining room/office - and I am STUCK. Beautiful space. What color grey is on the walls? Looks great! I wouldn't say that I have positive "messages" in my home, but I do try to make sure that meaningful items or mementos get prime space around the house. Gives me some inspiration towards my office. I love love love my Domino book. So sad that pub went under. Also, the pink ikat chair rocks. Love it, as always! Bright, cheery and 'homey'. 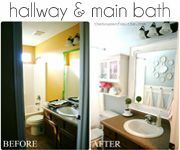 What is the paint color in this room? Finding a good grey is near impossible. Looks beautiful and very relaxing. I love your prints...especially the blog one. Very cute. this is amazing! i also have a very small space - & now i'm inspired! thank for sharing! I love the table!! And the I'm kind of a big deal on my blog. LOL! I was wondering what happened to that chair. You mentioned using hot pink awhile back, but I hadn't seen it. That's the perfect place for it and I'm loving your choice of pillows. The only thing I would add is something to put my feet up on. WOW!!! 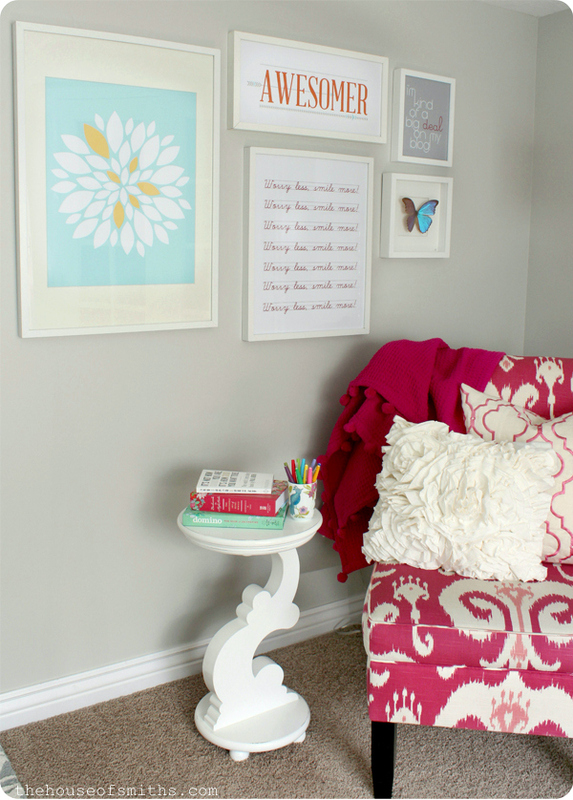 I love everything about this new space of yours: from the chair to the lamp to the artwork and especially the butterflies. Amazing. Stunning. You're so inspiring, I wish I was this creative and driven to turn my "dull" into "spectacular". You are amazing!!! The office looks great. My fav is the reading nook! 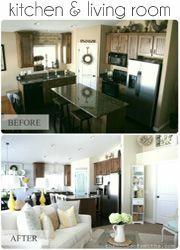 I know you've been working on this space for a while & I'm so thrilled it is done. It looks so fresh & organized. I absolutely love it. Congratulations! It looks great and inspiring! I'm sure it will be a wonderful room to work in. Great job! Everything is so beautiful! So many little touches that are making me envious. :) Enjoy!! I am curious...is your office in you basement? A beautiful space for a great blogger to work! that nook is a terrific addition to an already awesome-r office. I especially love that little table. great work! Wow! That is beautiful! I don't think I could get anything done in there though. My ADD would go crazy in there lol. It's very lovely;) I especially love the art, it's hilarious!! gorgeous! love the colours. I'd use that corner every day. such a happy place. LOVE IT!!!! The whole thing is perfect. You are so talented, my dear! I have some space in my office that could use an inspiring setup like this. Thanks for this post! Another great blog article, Shelley! I love your blog! Congratulations for doing a great job! The picture frames are really nice; I like how you put them on the wall. 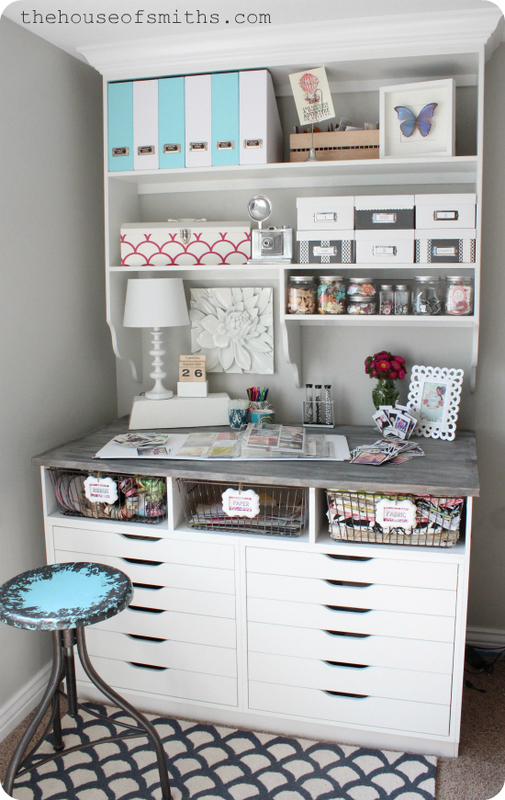 The organizing tips are amazing. How nice, Shelley! I decided to clean out my office (aka storage while other rooms are being constructed/revamped/dempolished). I felt the need to do this because I needed a space to work on my business and my blog! Though I love working from the sofa on my MacBook, I desperately needed some room to spread out my thoughts and get down to business. 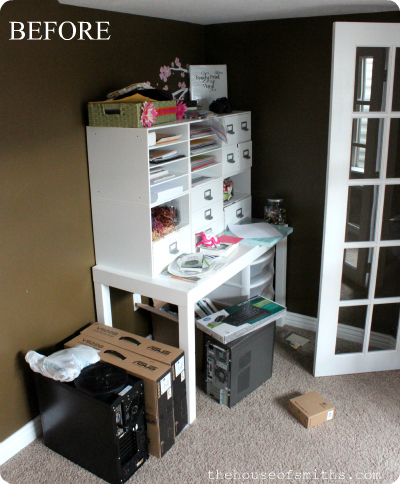 As I was laying on the floor in my "office", which was full of other random crap, I looked onto your blog and to my surprise, you were blogging about your office! So, thank you for motivating me to get off of the floor and get some serious work done! I too am wondering about the paint color. I love it!!! Hey there Shelley, I just love your choice of paint color. I am so bad when it comes to choosing paint color. I just painted my office and now I just don't like it anymore (after two weeks)!! I'm ready to change the color. 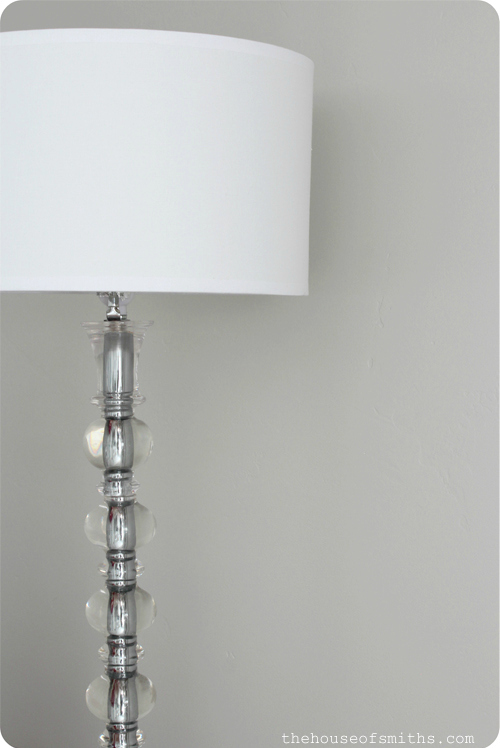 What color did you paint your room with? Thanks a bunch! Yes, please, I would love to know what color the paint is in your office. It looks fabulous with the white trim. 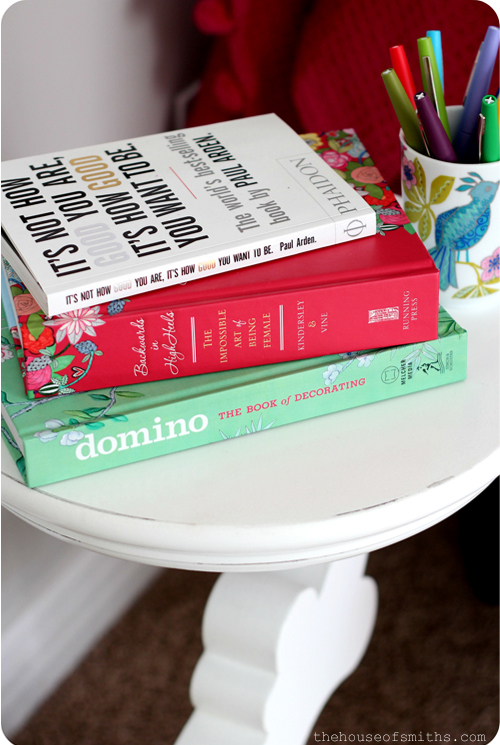 I've been searching my favorite blogs for some paint inspiration. Please share! I absolutely love the office, the funky chair, and your style in general! Thanks for sharing!